Automated testing has gained wider acceptance and adoption in the recent years, because of its inherent ability to increase coverage, the scope and depth of tests and instant feedback. For DevOps and Agile practitioners, the shortened dev cycles, automation of repetitive work, and sharper focus on the quality have significant ROI gains. But whether you are a new adopter of test automation or a veteran, here are some practices and tips that are worth taking note of. You can’t jump into test automation without appropriate planning. Not everything can be and should be automated. Ideally you should prioritize test cases that are run frequently. So repetitive tests that are run numerous times for various builds, tests that are likely to have more human errors, or those that require multiple data sets are good candidates. It is also worth automating tests that consume a lot of manual effort and those that are difficult to perform with manual testing. Planning and preparing your test suites is critical to the success of automation. Create a test automation plan and outline the initial set of tests that you want to automate. Remember that larger, complex automated tests will prove tough to edit and debug. Start by dividing tests into smaller, logical test chunks and grow as you go. For better management and faster access, consider centralizing your test assets though a common repository. It will help you avoid the costs of distributed resources and enable you to share your resources with developers. Centralized access lets you organize your test assets and maintain their integrity and reusability for future projects. Always conduct a validation and sanity check for automated tests to make sure that the tests are current. Validation ensures that you are testing what’s most important and you have designed good test scenarios. The right automated testing tool can make a world of difference to your efficiency and speed. While there are lots of tools available on the market, choose the one that suits your requirements the most. What are some criteria you should bear in mind before you make the final choice? QMetry Automation Studio uses open source test automation frameworks like Selenium and Appium to realize your Agile Testing goals with structure, efficiency, and reusability. Find out how it helps enterprises to accelerate unified testing. “Automating without good test design may result in a lot of activity, but little value.” It is important to create the test case manually to identify all pre-requisites and test data. When you flesh out the steps clearly and write the expected outcomes for each step, a lot of things become clear. Run this test case manually once to decide the flow of navigation and what objects need to be identified. This way you sometimes identify defects even before writing the script. It is a fact that many bugs are identified in the automation development phase itself. Test techniques that are useful for manual testing are also helpful in automated testing. For instance, Boundary Value Analysis, Equivalence Partitioning, Pair Testing, State Transition Training etc. can be very useful in automated testing. Well-structured test data lays the foundation for creation and execution of automation scripts. It is also easier to maintain and reuse high quality test data. Quality data is useful for data-driven testing. Ideally, the automation framework should be driven by data and enable input in various formats. This frees up significant time for execution of data-driven testing. Additionally, it simplifies the process of writing automation scripts at the product evolves. 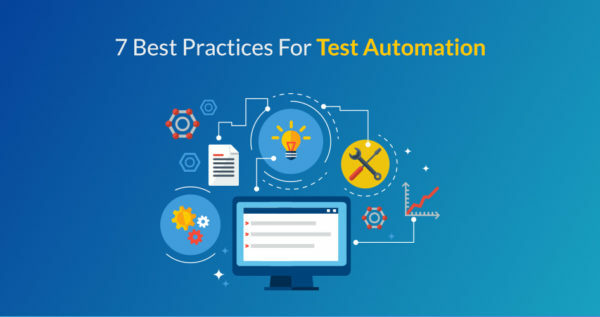 As automation plays an important part in the DevOps way of software development, adequate planning and organization are key to optimize your test automation suite. A well-defined test automation plan lets everyone focus on their core jobs and organizations can release better quality software faster.